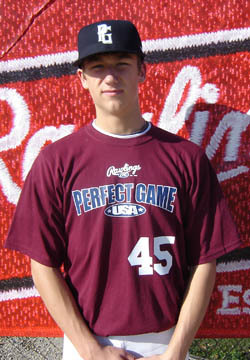 Hunter May is a 2010 RHP/3B with a 6'3'', 180 lb. frame from Cornelius, NC who attends Hopewell HS. May has a taller body, projectable build, L 3/4 arm slot, long whippy arm action, some effort, good armside run on FB, 11/5 CB, developing pitch, good sink on CH, projectable velocity, live fastball, some command, high level college follow, very good student.